THERE is a strange mystique that is attached to high mountain ranges and in some alchemical sense, a part of it rubs off on those who venture therein. Proof of that mystique is found on several pages of For Hills To Climb where even teenaged schoolboys find themselves consciously transformed by their Himalayan surroundings. This compilation of Doon School outings and serious expeditions from 1935 to 1965 — marking the Age of Innocence in the Indian Himalaya — is remarkable for displaying both the idealism that inspired masters and pupils alike and the toughness that saw them through their adventures. The Doon School was modelled (or muddled) on the playing fields of Eton and extraordinarily it has upstaged its original by the production of this book. (Probably the standard of English is better too.) It is fascinating to conjecture on what sort of volume the Germans or Japanese who are much more adventurous than the Brits would have compiled had their imperial plans hatched. English just happens to be the language of adventure although it is equally true that it probably reaches its ceiling of expression in the Alps. The Himalaya demands the profundity of Sanskrit or + flights of Urdu, so Doon School writers do contribute subliminally through their regional tongues’ subtle shades to the shot-silk fabric of Indo-Saxon. Most of the articles are lean and elegant and this suggests a long labour of love by the editor in Switzerland and the coordinators in Chandigarh and Dehra Dun. It is a hefty book beautifully produced and illustrated with fine old photographs and some colour plates of flowers (by Rupin Dang.) Cartography is always a controversial subject and I was surprised to see that a colonial survey anachronism had slipped through to offend both common sense and Uttaranchal sensitivities. How can Banderpunch, Gangotri, Jaonli and Kedarnath realistically be considered part of the Dhauladhars? Geography and English were considered Doon strengths, yet strangely JAK Martyn’s water-colour end paper of the view from Chandbagh omits the chief topographical feature: the town sits on the Ganga-Yamuna Watershed. The sketch is delightful enough to save the artist from a box on the ears but what to make of Mr Gibson’s literary lapse As I Saw It.? Published privately, this autobiographical jumble of diary notings, had it been produced by one of his students, would have earned the sinner six of the best for wilfully squandering a wealth of unique associations. The four pillars on which the Doon’s mountaineering reputation was built were all (for the most part) crusty bachelors. This enabled them to enjoy the rare luxury of giving advice rather than receiving it and allowed them more energy to further their vision. They all had an almost acetic disregard for bodily discomfort and a monastic singlemindedness in living up to the values they believed in. Jack Gibson writes casually "I went on with some local porters over the Lamkhaga Pass down to the Baspa valley to Chitkul and then back over the Borasu into the Har Ki Dun," implying that these high passes were a doodle. In fact, stamina and endurance of a high order is required to do even one of them. Of Holdsworth, it was said he would be so engrossed in umpiring a cricket match that he would not have noticed a herd of wild elephants to rampaging by. It is fashionable for populist netas to denigrate the Doon School as a safe haven for the sons of the rich and influential. This overlooks entirely the reality that no institution can survive without a healthy code of discipline. Since some of the books’ chapters together constitute the best account of Garhwal’s mountaineering assets it might be a good idea, at a time when the fledgling state of Uttaranchal is searching for its USP, to have these translated into Hindi (if not pahari) to enable the ordinary villager to learn of the contribution made to modern Himalayan climbing by Garhwali porters. Just as ‘Carpet Sahib’ has become a household name in the lore of Kumaon the reputation of Gurdial Singh rides high amongst the inner ranges of Garhwal. In the Statesman of August, 1955 he had written an article entitled Garhwali Porters First To Reach Abi Gamin Summit. Arthur Foot, the first Headmaster, was an Alpinist and in devastating testimony to how the mountains can bring out the best in a man he witnessed the school’s most delinquent pupil Nandu Jayal was transformed by them into a gentle, perfect knight. The most moving passages in the book are the obituary notices of Nandu’s early death. Here was one of the world’s leading mountaineers cut down by official folly in his prime. For readers the loss is doubly painful for Nandu Jayal rates amongst the best of mountain writers. His articles are stylish and zesty and would have been approved of by his inspiration Leslie Stephen, the doyen of nineteenth century Alpine authors. "The Himalaya," wrote Foot, completed his education into a status of nobility." Nandu’s insights on the sport he made his own echo this sentiment. In his summing up of a Saser Kangri expedition two years earlier, he wrote: "Pushing the body to utmost for something indefinably inherent in a person ...... is intrinsically noble and worthwhile." Bitterly ironical is the inclusion of H.C. Sarin’s obituary notice for Nandu. This senior defence bureaucrat, more familiar with scaling career graphs than mountains but with the power to decide the fate of serving officers, evades the truth while not telling a lie. This book is centred round the 1951 ascent of Mount Trisul by Gurdial Singh which marks the birth of modern Indian mountaineering. Whereas the British had smoked proprietorial pipes on the summit, Gurdial to demonstrate the local belief that all pilgrimages end in Shiva, performed the yogic asana of standing on his head. The real significance of his achievement lay in restoring the Indian attitude of reverence to the throne room of the gods. In the preface to this book Gurdial and Nalni emphasise the point. "Many of the articles have considerable literary, artistic and philosophic merit reflecting a very sensitive approach to climbing." 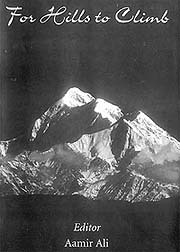 Nandu hammered home this theme when addressing trainee climbers, advising them to "feel physically small and spiritually great." The School’s contribution to mountaineering lay in stressing that means were as important as ends. It laid emphasis on noting the flowers and birds along the way and fitting them into the total scheme of things. Environmental wisdom was pioneered by the Doon expeditions and Nalni Jayal (who was with Gurdial on Trisul) went on to devote his life to good stewardship of the Himalaya. When I read Nalni’s version of the climb I suspect he had got his priorities right. On reaching Tridang he notes "The grass on which we camped was like a cushion sprinkled with tiny mauve primula and the gentle lapping of the running water recalled melodies from Beethoven’s pastoral Symphony. Iconfess a desire to bring my efforts to an honourable conclusion here — as long as somebody got to the top —and revel in this bracing and saner altitude." The School also set sporting standards in an age when false claims to summits (such as Nilkant) could lead to red faces and attempts at cover-ups. On the summit ridge of Mrigthuni in 1958 Aamir Ali recalls how the summit party hung around for nearly an hour while members set out to check in the worsening weather if there was a higher point. Contrast this attitude with two sarkari institutional instructors who halted in fine weather a whole kilometre before the end of their ascending summit ridge on the Arunachal border and shamelessly claimed to have climbed the mountain. In an age when writing is valued less than advertisements, the old world virtue of effacement is viewed as a weakness and the British notion that gentlemen did not discuss religion and politics interpreted as evidence of one’s commitment to conservatism. Nevertheless the book suffers from an unleavening of humour and, inevitable when pupils write of their teachers, not a jot of criticism about their oddities. We would all dearly love to know what exactly the four founding fathers thought of each other. Only Holdie emerges as truly lovable when he threatens to turn terrorist if Hitler won the war. What did these preachers of environmental harmony have to say about the introduction of nucleus spying devices into their beloved Nanda Devi Sanctuary? At least, Aamir Ali has the moral courage to question the sanity of military posturing on Siachen. To rescue the School’s reputation for being overly earnest theirs is the marvellous wacky outing of the brothers Pratap and Jai Singh Koregaokar who let down of the image of sons of the idle rich vacationing in Europe by turning their youthful attentions to attempting both Mont Blanc and the Matterhorn the hard way, without any equipment. The sublime nincompoopery of their actions is brilliantly recalled and deserves to share space with Nandu Jayal’s highest growing flower in the Guinness Book. I’m surprised someone hasn’t made a film of this cheeky and bizarre ascent of the Matterhorn in cricket boots and descent in crampons. It deserves a place alongside Lagaan. I love this compilation for its mood of exhilaration at just being there in fresh mountain air especially when mountain literature nowadays has become more agonised and pain-wracked. Psychological chunterings have replaced philosophical musings and desperate one-upmanship has obliterated the natural courtesy that the mountains once extended to the foot of man. Greed, desperation and chauvinism were no doubt in attendance at the first ascent of the Matterhorn but the glory of the surroundings still held precedence. Today it seems mountain committees outnumber mountain poets by 100 to 1. It is eyeopening to see how quickly change has overcome the Himalayan landscape. Joshimath was still a village in 1956. Dense forest ran between Dehra Dun and Rishikesh. Aamir Ali predicted Coca Cola in 1958 but Pepsi (chilled) arrived in 1982 on the Bardrinath route. And Nandu Jayal could settle disruptive porter behaviour with a boot up the offending backsack. The title of this book For Hills To Climb may seem modest under the circumstances but it does point to the joys that lie in any mountain exposure and not just in summating. The words are taken from a daily prayer of Thanksgiving and I too recall the best moments of my school days from such fragments of poetic inspiration. The success of the Doon School, witnessed in this book, has been in harnessing the inspiration of the Himalaya as in educational tool. The words of Holdsworth in assaying the worth of his pupil Nandu Jayal give us a glimpse of what real education is all about: "He died very much the master of himself and of most of the world that is worth mastering."